The award-winning work was done in mice, but it has been shown to be true in other animals too. Seed-caching birds and brood-parasitic cowbirds are two of the most remarkable examples that rely on spatial navigation for their existence. Their directional skills can even surpass those of some humans! Seed-caching birds store food in hundreds or thousands of sites, and retrieve it hours or even months later. The Clark’s nutcracker (seen above), for instance, displays the most striking hoarding behaviour, making more than 5000 caches of seeds in the autumn and recovering them seven to nine months later in the spring. 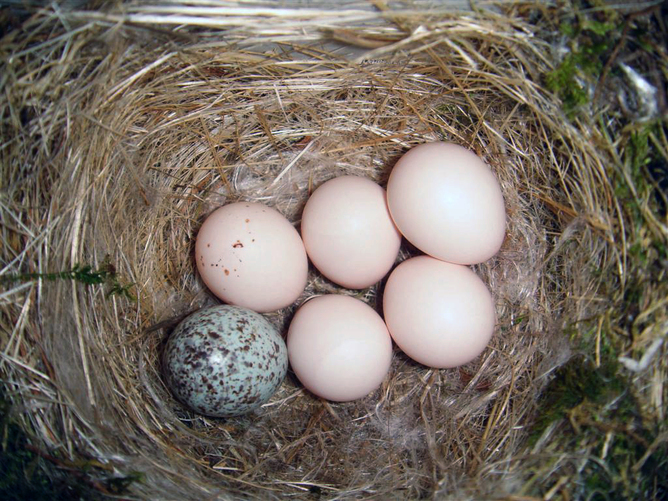 Similarly, female cowbirds search for host nests in which to lay eggs. Like cuckoos, they do not raise their own young and want to ensure the host that does will definitely be tricked into doing so. They perform a meticulous daily examination of various nests before making a decision and returning to the selected one a few days later. The reason for this is that the survival of the baby cowbird is dependent on the relative timing of hatching of host and parasitic eggs. The female cowbirds can only lay their eggs in the hosts’ nests when the host is also laying her own eggs, making the nest very briefly available to the cowbird. Nests must therefore be erased from the cowbird’s memory as “potential targets” once they are no longer available, just as hoarders have to discard cache sites once they have recovered the food stored in it. Researchers at the University of Oxford have recorded the behaviour of female brood-parasitic cowbirds, who compete to lay eggs in the host’s nest. We know that the human brain adapts to meet our daily environmental demands. For instance, the famous “London taxi driver” study found that black-cab drivers had larger hippocampi. The expansion may be most likely because of their dependence on the skills needed to navigate their way through the thousands of winding streets in London. Are the brains of these birds also specialised to meet the extensive spatial navigational demands that are central to their survival? Yes. The hippocampus of seed-caching birds is larger – relative to total brain size – than that of non-storing birds. Notably this enlargement is absent in fledglings and only begins when the bird begins to hoard. Similarly, the hippocampus of female brown-headed and shiny cowbirds is larger than in males, presumably because it is the females that actively search for host nests. In related species that do not search for host nests at all, such as the bay-winged cowbird, or where males and females search for nests together, such as the screaming cowbird, the sexes do not differ in hippocampal size. Scientists have also studied if preventing cowbirds from searching for nests would result in a decrease in hippocampal volume. Brown-headed cowbirds were kept in aviaries that had no hosts’ nests. As expected, captive female but not male cowbirds had smaller hippocampi relative to their wild-caught counterparts when they were prevented from searching for nests for one year. These findings raise the possibility that hippocampal enlargement occurs alongside the bird’s need to navigate. But does a bigger hippocampus provide these birds with a memory advantage? This is a complicated question, largely because it is difficult to associate one particular kind of memory with one structure in the brain. In an attempt to answer this question, however, scientists have mimicked the seed-retrieval process within a laboratory setting”. In the first part of this task, the bird searches for and eats part of a peanut placed in one of several identical feeders in the room. After some time, the bird searches the feeders for the remainder of the peanut, which is still placed in the same location. This task resembles the process of “retrieval” of stored food in the wild, since the bird is required to return to the peanut after a single previous experience of its location. However, it does not study “storing” since the bird does not place the peanut in the site itself. Seed-caching birds typically perform better on such tasks than non-storing birds. This suggests that hoarding birds store spatial information more accurately than non-hoarders. It seems then, that there is a link between food-storing behaviour and spatial memory. But how does the hippocampus fit into this interaction? To understand that, biologists simply lesion the hippocampus and observe the resultant effects on behaviour and memory. Damage to the hippocampus does not seem to affect motivation, hunger, or performance on non-spatial tasks, but instead selectively impairs memory for the location of food. It may be, then, that hippocampal enlargement is related to spatial memory during cache recovery. The evidence for a link between behaviour, hippocampal volume and spatial memory is not straightforward though. For instance, one study showed that male and female cowbirds did not differ in performance on a spatial memory task, even though females had larger hippocampi. However, given that we do not know how laboratory settings match up to natural environments, there may be other factors that we are unable to control for. Yet, it seems reasonable to suggest that the brains of food-storing and brood-parasitic birds have adapted to meet their extensive navigational demands. This article is modified from its original publication on The Conversation. Read the original article.